I recently purchase a Targus CVR200 laptop case to use as a briefcase for papers, folders, notebooks, and general supplies. It is meant to carry a laptop, but you can use it to carry anything. I did some research online and checked out several different models in the stores. I decided on this model because it is a good size, not too big, not too small, it is stylish, and it is light. The Targus CVR200 is made of neoprene which is light, has some stretching ability and stays relatively clean. It has a main zipper opening with 2 sides. It also has a buckle flap section with more room and holders for pencils and smaller items. 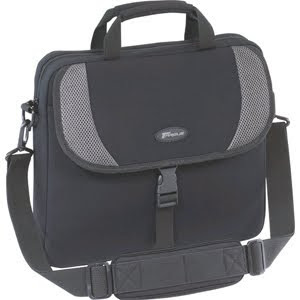 The case comes with an adjustable shoulder strap as well as the carrying handle. I have been using the case for several weeks now and so far it is great. There is only one problem I have encountered. Recently I washed the case by putting it in the washing machine. Bad idea. The neoprene ripped in the washer. It was just the top part near the seams, so it is still usable, but I had to sew it up and it doesn't look as good as before. Over all this is a good case for carrying things, but if you are going to wash it, do so by hand. Update: 4-8-15 I still have the bag and it has been pretty good in the long run. Overall it has not worn down much even after using it pretty much every day. I would recommend this bag if you are looking for a light and stylish laptop bag or carrying case. Good and exact review abot this bag, but belt is adjestable with soft Variable and nun-slip pad is exellent for sholder. Yes, the shoulder strap is comfortable and useful for carrying the bag.